Feb 20, 2001 in "SpectroMagic"
LAKE BUENA VISTA, Fla. -- It’s time to say “good bye” to a cherished favorite. The “Main Street Electrical Parade” is a beloved procession of Disney stories brought to life in shimmering colored lights and bouncy, bubbly music. “Alice in Wonderland,” “Cinderella,” “Peter Pan,” “Dumbo,” “Snow White” and “Pete’s Dragon” are featured during the 20-minute spectacle. Magic Kingdom guests can share in the delight of the “Main Street Electrical Parade” every night of the week beginning Feb. 16. Show times will vary. After leaving Disneyland in 1996, the “crown jewel of summer” underwent a dazzling makeover of 575,000 glittering new lights and a 2,400-mile transcontinental journey before its return to the Walt Disney World Resort in June 1999. 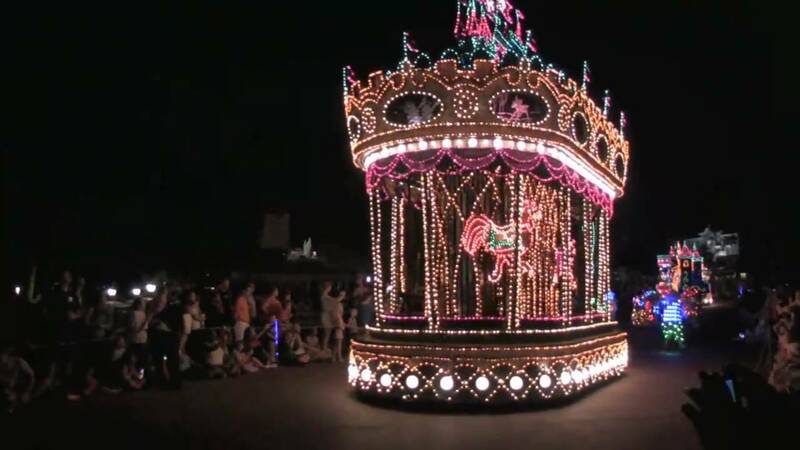 Longtime fans may recall a version of the “Main Street Electrical Parade” that was crafted for the Walt Disney World Resort in 1977. It bid farewell after 15 seasons to begin an engagement at Disneyland Paris. Fans of that parade will recognize some units from the original Disneyland “Main Street Electrical Parade,” including the Blue Fairy from “Pinocchio” as the “grand marshal” aglitter in a winged gown of more than 10,000 blue, amber and crystal lights. The “signature” unit for the parade, the Casey Junior Circus Train (from “Dumbo”), has Goofy at the controls of the engine, pulling a huge bass drum that announces in lights, “The Magic Kingdom Presents Main Street Electrical Parade.” The memorable float finale honors America with a flowing red and white field of lights, “fireworks” and a golden eagle. Combining the energy of seven lightning bolts, the electrical power of a fleet of 2,000 highway trucks and a sprinkling of pixie dust, “SpectroMagic” returns to the Magic Kingdom on April 2. Like the “Main Street Electrical Parade,” “SpectroMagic” takes beloved Disney characters and decks them out in sparkling detail. The parade features a glittering array of flowing fiber optics; holographic images; clouds of underlit, liquid-nitrogen smoke; and old-fashioned twinkle lights, precisely choreographed to an emotionally charged, original soundtrack which uses dashes of classic Disney tunes. Mickey Mouse in glistening lights with “a confetti of light” sparkling in the air around him heralds the 20-minute production. Dressed in an amber and purple grand magician’s cape, he plays the role of a light-controller capable of altering colors, brilliance and types of lighting effects. The title float, proclaiming “SpectroMagic” in flowing fiber optics, is surrounded by SpectroMen atop spinning, darting whirlyballs. Practical Pig, poised before the magical world of Disney’s characters (more than 100 feet in length and featuring castle towers, a carousel, a bejeweled coach and other dreamlands), flicks a paint brush to change the colors of the characters’ world into silvery white. Chernabog, memorable for his role as the monstrous demon figure in “Fantasia,” is portrayed in dark, eerie colors as he dramatically spreads his wings to a 38-foot span. The Three Good Fairies in Sleeping Beauty’s garden create the sparkle of day among the flowers and insects...and magically transform the scene to the mystery of night.